Students who complete the Marine Mammal Behavior, Care and Training (MMBCT) program will acquire the practical knowledge and skills to successfully assess marine mammal behavior, adeptly provide appropriate husbandry care and apply positive training techniques for the well being and enrichment of marine mammals in human care. Additionally, graduates of this program will learn a variety of presentation techniques to assist them in educating a wide range of audiences. Students learn to give presentations that are entertaining, informative, flexible and motivating. This guides audiences towards positive conservation practices benefitting marine mammals and the environment. Students will also gain important critical thinking and communication skills that prepare them to participate in a work environment as a cooperative, supportive, positive team player. Graduates will be prepared to seek positions as experienced marine mammal trainers at facilities that house/display cetaceans and/or pinnipeds, although skills may easily be transferred to other marine or terrestrial species. Program length is August through April for 36 weeks. This is an intensive immersion program which requires students to participate in programming up to 10 hours a day and up to 5 days a week (not including study time). Students will be trained to function as an experienced member of a team of marine mammal care and training specialists caring for and actively training marine mammals in a human care setting. Graduates of this program will have received both classroom instruction and hands-on lab experience that will prepare them to effectively care for and train marine mammals. This experience will fully prepare graduates for entry-level employment at a marine mammal facility. Extensive training (both theoretical and hands-on) will help students to develop skills to confidently narrate and present marine mammals to the public (both large and small audiences), as well as conduct interactive dock programs between people and dolphins in a safe, enjoyable and entertaining manner. All theoretical, lab instruction and practice will be conducted on-site at Dolphin Research Center. All students are expected to maintain the highest personal and ethical standards of conduct consistent with the professional effort expected by DRCTI faculty and all personnel at Dolphin Research Center. These standards are outlined below. Any information indicating that such standards are not being maintained will be reviewed by faculty and may result in student dismissal by the college administration. All students must meet attendance requirements as defined by program policy or guidelines. Absences must be planned and coordinated in advance with the program director. Programming extends up to 10 hours a day and up to 6 days a week, not including study time. As this program includes participation in the operation of a marine mammal facility that is open to the public, students are expected to work holidays and weekends. Due to the nature of a facility that cares for live animals, students are expected to be on call for the entire duration of the program. Use the appropriate communications channels. Take actions rather than acting on assumptions. Deal positively and confidently with unexpected events. Adhering to organization policies, procedures, and guidelines. Seek reasonable and mutually beneficial agreements/solutions to solve problems/achieve goals/directives. Mobility:Without assistance, sufficient to rapidly walk the span of Dolphin Research Center without interruption, run and swim distances of 50 yards, easily maneuver on and off floating/moving platforms without assistance, maneuver in tight spaces while manipulating overhead objects, work outdoors in both intense sun and heat as well as under rainy and cold conditions. Students are required to participate in facility cleaning and maintenance including the repair and maintenance of habitats, fences, equipment, and training props. Students will be required to prepare the diets of all animals in the facility under the supervision of DRCTI/DRC staff members and are also required to conduct extensive cleaning of husbandry area and materials daily. Motor Skills:Gross and fine motor abilities sufficient to provide safe and effective animal care, including: without assistance, the ability to routinely lift 50 lb. boxes of frozen fish and maneuver non-motorized rolling carts carrying up to 60 lbs. over the entire span of the facility (approximately 230 yards) without interruption. Hearing:Ability sufficient to monitor human communication, auditory training bridges and animal vocalizations and behavior across large distances (half the length of the facility animal habitats combined). Each MMBCT student is responsible for his or her own transportation and travel expenses. A portion of the curriculum involves travel by students to other marine mammal facilities within Florida that might fall within a 150 mile round trip from Dolphin Research Center. Other costs incurred by Marine Mammal Behavior, Care and Training (MMBCT) students may include, but are not limited to: physical health examination, equipment replacement fees, copy and printing fees, field trips and travel, food, personal supplies, and living expenses. Program pricing does not include food, transportation, personal living expenses or housing. Students are also responsible for all fees associated with any physical examinations that may be required. The Course Registration Fee ($150.00) must be submitted with the Student Enrollment Agreement. $2,000 initial payment due prior to the beginning of the course (by August 15). Thereafter students would pay 8 installments of $2,250 at the beginning of each month throughout the program beginning Sept 1 through April 1. ($18,000). Payment may be by check, certified check, money order or credit card (Visa, MasterCard, or Discover). 1. Cancellation can be made in person, by electronic mail, by Certified Mail a minimum of 60 days prior to the start of the program or by termination by the School. 2. All monies, minus the registration fee will be refunded if the student cancels within three (3) business days after signing the enrollment agreement and making the initial payment. 3. Cancellation after attendance has begun, but prior to 40% completion of the program, will result in a Pro Rata refund computed on the number of hours completed in relation to the total program hours. 4. 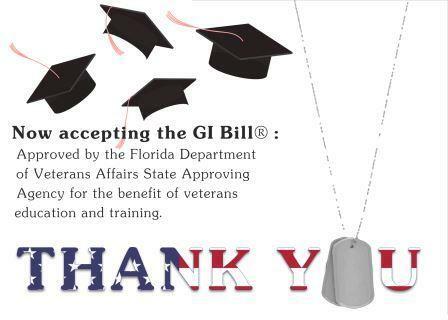 Cancellation or termination of a student from the program after completing 40% of the program will result in no refund. Please see payment schedule options on page 26. Tuition is collected on a monthly basis throughout the program, not quarterly and the 40% completion is reflective of the entire program. 5.Termination Date: In calculating the refund due to a student, if applicable, the last date of actual attendance by the student is used in the calculation unless earlier written notice is received. 6. Refunds, if applicable, will be made within 30 days of termination of student’s enrollment or receipt of cancellation Notice from the student. *Student will attend all classes at all times barring verifiable hardships. *Student will maintain a grade of C or better in every class. full repayment of the scholarship received. The DRCTI is embarking on becoming eligible for Title IV funding. This process will be ongoing for two years or more. Until the DRCTI is approved to accept Title IV funding, students must obtain private funding. Until we are approved, by law, we cannot accept financial aid funding for students. The DRC Training Institute is pleased to offer the Kibby Memorial Scholarship each year to a deserving student. Kibby was a member of the DRC dolphin family for many years and was a great teacher to all of his human friends. After his passing in 2013, we wanted to honor his memory in a special way. A major donor learned of this need and generously provided an endowment for this purpose. Each year, one student will receive a scholarship of $20,000.00. The award will be based on the greatest financial need out of the pool of students who apply for the scholarship. * More detailed information and an application will be provided to all students once they are accepted into the program. ** All scholarship opportunities are available based on funding each year. 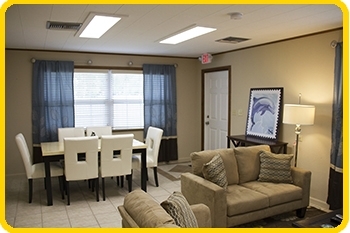 The DRCTI Student Residence provides economical housing for up to six students throughout the entire duration of the MMBCT program. 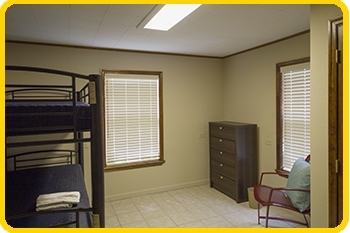 DRCTI Student Residence bedrooms are shared with two to three students per room. One private bedroom is also available. 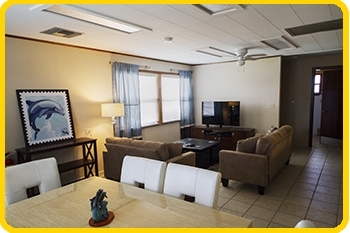 Cost per month of these rooms is rated based on the amount of space shared and the value of the room. The shared bedrooms are composed of either bunk or loft beds. All bedrooms will have desks and clothing drawers space. Closet space is also available. One full bathroom in the residence is communal. 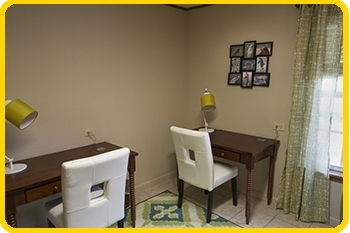 The DRCTI Student Residence has a full kitchen, dining area, living room, a study room, and laundry facilities. 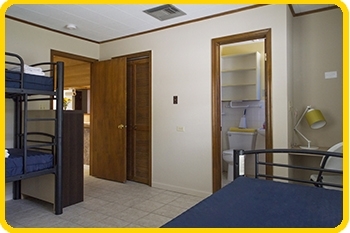 3 person bedroom: $250 per month, due the first of every month. Private bedroom: $750 per month, due the first of every month. DRCTI Student Residence applications will be included in student enrollment packages upon acceptance into the MMBCT program. Students may apply for a Work Study Award which provides a $150 per month discount from DRCTI Student Residence rent (regardless of the room assigned) in exchange for weekly cleaning responsibilities as outlined in the Work Study Award description. This legislation requires each licensed institution to inform students and employees of the existence of the Florida Department of Law Enforcement (FDLE) sexual predator and sexual offender registry website and toll free telephone number. The DRC Training Institute offers one work-study award which will be given to a student accepted into DRCTI programming whose motivational levels exceed their bank accounts. This award will provide a $150.00 discount per month on the DRCTI Student Residence housing for the duration of the program in exchange for weekly cleaning responsibilities of the entire residence throughout the duration of the student's program enrollment. Thorough cleaning of each bathroom, including floors, sinks, toilets and shower stalls. 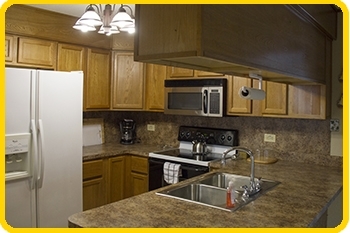 Thorough cleaning of the kitchen area including the floors, interior/exterior of refrigerators, countertops, sinks, microwave and stove. The Work-study award is made each year based on financial need. Students accepted into the program will be sent a Work Study Award application. You will be notified of your status by letter, mailed after May 1st.